What's New in this Lightroom Release > Lightroom CC Windows/Mac Updates > Lightroom CC vs. Lightroom Classic – Which Do I Need? There are two different versions of Lightroom – the cloud-native Lightroom CC and the traditional folder-based Lightroom Classic. So how do you figure out which you need? I’ve prepared a flow chart to help you make your decision (although of course it doesn’t cover all possible variations and workflows!) and a feature comparison of the desktop apps, which I’ll continue to update as new features are added to Lightroom CC. I’ve written more extensive books for both Lightroom Classic CC version 7 (available now) and Lightroom CC (coming soon) in eBook and paperback formats. It seems like the photography plan bundle is more consistent with the current LRCC/LR Mobile scenario. I current use LR Mobile and my iPad to get images to the cloud and then to my desktop while on the road. Then, my images are on my desktop when I get home. It is the primary method I use for LR Mobile. In this new announcement, I will clearly need LR Classic for it’s expanded feature set at least for now. What I don’t know is whether the feature to decide which images live in the cloud vs which do not will continue to exist. Also, will collections continue to be the way this is done in LR Classic or has that changed? Overall, I’m happy to see Adobe focused on improving performance. Robert, if you need Classic (and it sounds like you certainly do), then you can simply stick with your Photography Plan Bundle. Nothing changes for you. You’ll still be able to sync specific collections as you have done for the last few years. Wait, didn’t we hear that Classic and CC have different catalog structures? If so, how do I use the photography plan bundle? If I use CC for uploading but want to use classic on my desktop, do I need separate catalogs? Or am I only using CC in a limited way. Further, I have too many images to fit into 1TB in the cloud and will only want a small portion of my portfolio to reside there. I agree I think I need the photography bundle plan but it’s the fine details of using this plan to fit my desired workflow that I’m worried about . 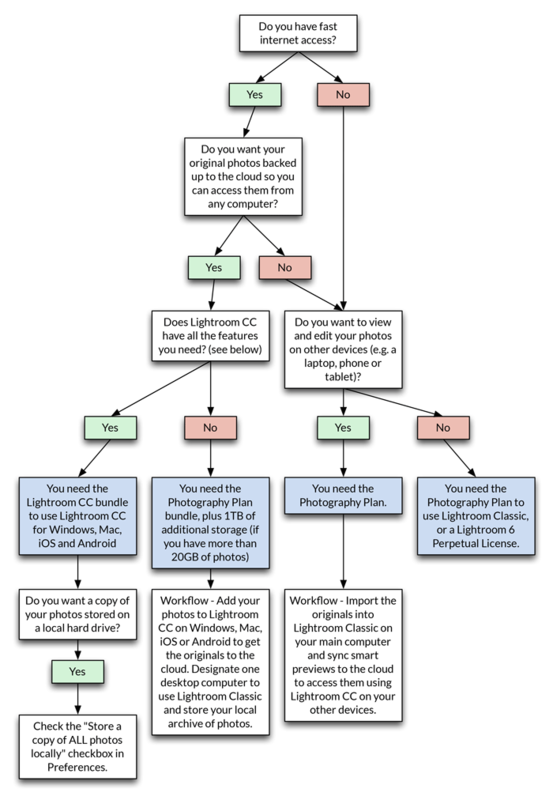 . .
At this point, you’re probably best to ignore the Lightroom CC desktop app, and just continue using Lightroom Classic with the mobile apps, exactly as you have been. There are “foot in both camps” workarounds that involve using the Lightroom CC desktop app to get originals to the cloud, which then sync back down into your Classic catalog via cloud sync, but they’re messy as anything. If you want to carry on working exactly as you have been, then nothing changes for you. I also have been working the same way Robert describes, and so far I need to keep using the classic desktop features. My question is: so far, it seems like I can import any amount of photos through Lightroom Mobile and they upload to the cloud and then download to my desktop, even if I go over 20GB. Will that still continue to work if I don’t change my plan to have more cloud storage space? No, that will be limited to 20GB in future Jessica. Smart previews synced from Lightroom Classic don’t count toward that allowance though. Thanks for the info. So what would happen if I import, say, a 32 GB card on my iPad LRM? Will it give me an alert, or will it just not upload the items, or what? I’ve been doing that for the past six months or so and it’s been fine, but I guess that will change? I’d like to get the 1TB of cloud space instead of Photoshop, which I don’t use, but it looks like that option is only available if I switch to the new LR CC and I can’t do that because I need the LR Classic features that aren’t in the new one. I can’t test the theory as I have the full TB Jessica, but AFAIK it’ll let you import them into LRM but won’t upload. You’ll need to stick to your current plan as you need Classic at the moment, but you can add 1TB of storage to that plan for an extra $5 a year for the first year, and $10 a year thereafter. $5 a year, not a month? That sounds great – where do I find my cloud storage options? I didn’t notice that option listed when I was browsing the new plans. Oooooops, that was a big typo wasn’t it! Sorry, 18 hour days are catching up. $5 a month. Ok… where can I see how much cloud storage I’m using? I hope they adjust the plans so we can use LR classic without photoshop and with more cloud storage instead. What if I wanted to use LR classic on my main computer but LR CC on a secondary computer – would I have to pay twice? If you go to https://lightroom.adobe.com, click the LR icon in the top left corner then Account Info, it’ll tell you. Classic on one and LR CC on another is included, and it’s a great way of dipping your toe in the Lightroom CC water and seeing which features you’d miss. It works like having the mobile app on a real computer. Thanks, you’ve been such a big help! I can’t believe I never heard of this blog before but now I’m subscribed. Victoria, do you have a tutorial on the “messy as anything” workaround to use Lightroom CC to get originals to the cloud, and then cloud syncing to Lightroom Classic? Nothing public yet Helen, but the Cloud Sync chapter of my Lightroom Classic Missing FAQ book covers what syncs in which direction (page 484-486) and ideas of how you might use both together (page 486-487). I’m working on some more detailed information, but I can’t give a timeline on that yet. Thank goodness for your effort. This is EXACTLY what many of us needed to ferret out which version would be the appropriate one to select. In my case, no question, it’s the Classic Version. Agreed. Thanks for the workflow! However, the choice seems easy for now. I have too many plugins, third party software and need too many features (HDR, Pano) to leave LR Classic. Victoria, EXCELLENT write up! You really helped me figure this out! many thanks for the comprehensive overview! I miss some information about camera profiles and the CC Version. Is it known, if Lightroom CC 1.0 already supports camera profiles? It supports them behind the scenes, but there’s no UI for them at the moment. If you’ve applied them in Lightroom Classic, they’ll still work though, and you can even create presets for them in Classic and then load those presets into CC if it helps. If I use the new Lightroom CC (with 20GB of cloud space) can I choose what gets put in the cloud and what gets stored locally? What happens if I run out of their cloud space but I don’t want to pay extra? Can I just keep storing photos locally? Thanks. It’s 100% cloud storage at the moment with the new LRCC. If you run out of space, you delete photos or pay for more. That may well change in future, but there’s no selective sync at this point. Classic is still the way to go if you don’t want everything in the cloud. This is the thing that concerns me most about the new LRCC. I have around 6TB of photos and it is just not economical, practical or desirable for me to be able to have that amount of data in a cloud (even if it were possible to have that much cloud storage). So for me LR Classic is the only viable option (plus I simply don’t need to be able to edit my photos on a tablet or other device) but to quote this website ” Lightroom Classic, isn’t going away anytime soon” but then in the page on The End of Perpetual Licenses it says “Adobe will continue to sell Lightroom 6 as a perpetual license, but Lightroom 7 and future versions will only be available to Creative Cloud subscribers”. Therefore I can only infer that in order to be able to continue to benefit from new features etc the only option will be to pay vast sums of money to store photos in a cloud that I only want to access from one location and which I could do for free on a hard drive. Yes I could ‘accept’ that the LR I have today does what I’m happy with and forsake any new features but this doesn’t factor in the fact that operating systems will get updated and how long before the current standalone version of LR won’t run on a new OS? Lightroom Classic is the one you want. 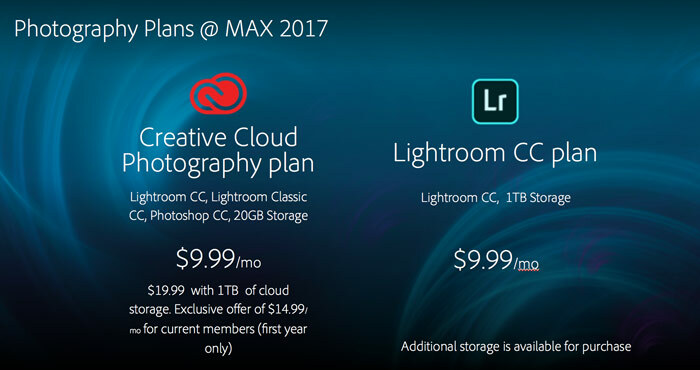 They’re not selling perpetual versions any more, but you can get it on a Creative Cloud subscription for $9.99 a month. It’s just a different licensing system – you don’t have to upload ANY of your photos to the cloud from Classic if you don’t want to. Ignore the new cloud-native Lightroom CC at the moment, as it just isn’t the right tool for you. I am unsure how this is going to work. I have 177,236 image files (most are RAW but does include some derivatives and, of course, the xmp files). This currently takes up 2,11 TB of hard drive space. I can’t imagine how long it would take to upload that to a Cloud… a week? Could one take the smart course of action and shop around for Cloud space? Would the “new” Lightroom allow the user to choose the source location? You might want to stick with Classic for now Ron. 2.11TB would take me about 2 weeks, but it’ll depend on your connection speed. If you go to http://www.speedtest.net it’ll tell you your best upload speed, and then we can google for a calculator to work out roughly how long to expect. You can’t shop around for cloud space with this – a lot of technology is actually being run on Adobe’s cloud servers. Backup is simple enough – it all goes to the cloud as a backup, and you can keep a copy locally, which you can back up yourself in additional locations if you wish. – Shooting on location = Importing a few hundred/thousend RAWs on my Notebook; No fast Internet in the Hotel/on Location, no such a big mobil data plan. So i sort/edit localy; maybe while riding home by plane or car. seems Adobe things “the cloud” is the smart solution… well.. no! – no idea why i should pay for 3TB Cloud-Storage when most RAWs are laying there for months/years until i need them again, maybe. You’re definitely not the only one in that situation Boris, and I’m certain Adobe are well aware of it. Much of the world has limited upload speeds, so if they ever decide to sunset Lightroom Classic, they’d have to make sure that the new baby Lightroom CC has all the features needed for you to move over without uploading everything. That could come in a number of different guises, for example, local storage with local network sync for originals, and just smaller versions sent to the cloud, or…? For now, you’re best off sticking with Lightroom Classic. I think I made a mistake choosing LRCC instead of Classic. How do I get back to Classic? I’ve already subscribed to CC? That depends… how did you move to CC in the first place? Using the Classic>CC migration tool? Or perhaps you haven’t used Classic before? I’ll have to come back to you on that one Paul. It’s all a bit new for all of us, and I’m sure they’re still updating the site too. LOL I can always trust Adobe to create enough confusion to keep me in a job! 😉 I’ve dropped an Adobe staff member an email to find out the answer, but most of the ones “in the know” are at the Max conference right now. I have a note to reply to you when I get an answer though. In my home/stusio in southern Scotland, we have 2.5Mbps (bits not bytes!) download and 0.6 Mbps upload on ADSL and no mobile telephone signal at all, let alone 4G, so ussing any sort of cloud service is just a fantasy! A 20 Megapixel image takes me many minutes to upload and a day’s shooting is a week’s upload. If I bought a Nikon D850 then I could probably manage to upload one day’s images in a month! Now, if Adobe also paid for a fibre (or even a decent copper) connection to my house, I might look upon their cloud service with favour. Ah, but hang on… If I have images that a client considers to be private (I have a lot of them), EU data law does not permit me to send them to places like the US where data protection law is not compliant with EU requirements. The server on my LAN is the place for my images! Also, since they already use more than a Terabyte, a 20G allowance is not all that attractive (and they would take more than a year to upload if they offered more space). I am certainly now looking for an exit strategy after a decade with Lightroom! Yeah, that’s fine Alistair, that’s why they’re still plowing a mass of resources into improving Classic too. The new CC app is a new tool for a different audience. No one’s under any illusions that it’s the right tool for everyone, and especially not for a lot of working pros. That may change in future as it continues to develop, but there’s no need to start looking for an exit strategy. Lightroom as we know it isn’t going anywhere. In that case Victoria, it makes one wonder why Adobe did not keep the perpetual licence going for those of us that needed it as they would still be getting their money and more new users if they continued to support it. Working on the new version is going to take ages to perfect and as Alister pointed out we still have an outdated broadband system here in the UK especially in rural areas. Another factor that adobe should have taken into account is that many of us haven’t got the time for them to perfect it. I’m 73 and all I want to do is to enjoy my photography and LR as it was. Being loyal and accumulating a vast amount of images using LR 1 to 6 did not pay and its too late to start a new learning curve with new software. Adobe just cut it’s nose to spite it’s face. Shame. Lightroom Classic continues to run on the local computer Vic, just like Lightroom 6, so it doesn’t require fast internet and there’s no new learning curve. It’s just like getting Lightroom 7, but paid monthly. They did make a business decision to move to payment by subscription rather than perpetual licenses, and there are numerous pros and cons to that decision. I know not everyone likes the decision they made, but it’s a separate issue to the cloud vs. desktop issue. Thank you for your hard work on this helpful information. You are a treasure. It looks like Lightroom CC for iOS still does not support custom presets or syncing of presets from Lightroom CC desktop. Any idea if that’s coming in the near future? I don’t have a timeline to share, but I’d certainly expect that to be high on the list of priorities. I’m going to stick with LR Classic, but I do have question about new LR CC regarding a friend I’m trying to get started in Lightroom. If she has 2 computers running the LR CC version, do they have to share a catalog & cloud file storage structure? Or can they have 2 separate catalogs & file storage structure? I’m guessing the former. Also, with LR Classic, will all my develop presets, etc. transfer from current version OK? 2 computers, both running the LR CC version, are connected via her cloud account. Just the one cloud account, so there’s no concept of multiple catalogs. Yes, all of your presets etc. should transfer just fine. That was what I suspected. Thanks, again. Your tips on Vice Versa (Windows) for cloning and mirroring drives was helpful; a few months ago I switched to Mac & your tip to use Chronosync for cloning and mirroring drives was dead-on again! Ever since had to fight the process to get some a perpetual licensed copy of LR6, I had the feeling thatsomething like this was coming. I chose to continue my use of LR5 and investigate other options. It’s with sorrow I chose to do so since I have been using LR since v1. I am now up to v6. I cannot support their subscription pricing model. I did for several releases of Photoshop and Dreamweaver. That’s understandable Walter. You have to make the best choice for you. I upgraded to LR Classic. I made a backup copy of my catalog and imported it into LR Classic. The conversion didn’t take too long at all. I went from a catalog file that was 2.83 GB to 1.2 GB. So far, I like the speed and moreover the smoothness of this new version. So far, it seems like they did a good job. That’s great to hear Robert! Thanks for the update! Very nice article explaining the options and differences. The LR CC is it does not support two monitors, that is a problem for me. I have been happy with the CC Photographers Plan. I think I read that LR CC could be installed alongside classic so that’s the best of both worlds for me I can continue with the Photographers Plan and test the LR CC plan at the same time. Yes, you can try both at once. For testing alongside, I’d suggest syncing smart previews to the cloud from Classic and then viewing/editing them in LRCC, as you would with a mobile device. 1) when I import photos into CC how do I get them to sync with Classic? 2) for my historic catalog how do I get that in CC and keep the catalogs in sync? 3) I take photos of my son’s sports, and frequently come back with 1500+ photos which I triage down to 10% of that figure (so 1500 down to 150). Should I import them in Classic, triage them, and then try to sync so I can use them in CC? Or import into CC and triage them there and use Classic for some of the features not in CC if I need them? Trying to get originals to the cloud using CC desktop and also using Classic is a bit of a minefield. I’ll do some posts on it over the next few weeks, but I’d suggest keeping Classic as your base, letting it upload smart previews to the cloud so you can access/edit them in CC mobile. Great, thanks for that. How do I sync smart previews to the cloud? Do they have to be in a collection? Either put them in a synced collection, or just drag them to the All Synced Photos collection in the Catalog panel. Thanks Victoria for your informative blogs. I am sticking with the ‘Classic’, and my catalog conversion took under 3 minutes (54000 photos). All presets are exactly as they were. I thought that “Merge to HDR & Panorama” had stopped working, but a restart of Lightroom and they are faster than before. I also updated Photoshop CC, and amazed- the program opened to desktop in a “blink of the eye”! Now that I LOVE to hear Robert! I’m like to use cloud in backup purpose but I can’t just figure it out. Hear is what I like to have and maybe some smart cane hint me in right way. I have a workflow in LR so I need classic but I like that classic cane copy a copy of my fullres pic to cloud as a “backup”. Then I cane use LR Mobile and this “backup” to edit on the go and changes will then sync back to my classic folder. So basically I like to have my RAW in locak for editing in Classic and even send to cloud instead och smart preview. Classic can’t send originals to the cloud, just smart previews. You’d have to use CC to get the originals to the cloud, and that gets messy for existing photos. I will follow up with blog posts in coming weeks, but “a foot in both camps” is far from ideal right now. Question …. When the CC option for LR came out with syncing smart previews, there was a distinction that our 20GB cloud storage space was Creative Cloud drive space, and the smart previews were separate and did not count against that space. Have they merged the 2 clouds to 1 20GB allotment per user (unless I upgrade to the 1TB)? Or are there 2-20GB clouds managed separately? Yes, the Lightroom Sync cloud and Creative Clouds have merged into a single 20GB thundercloud. 😉 Smart previews still don’t count against the allowance though. This is very helpful information here… so I only need to worry about cloud space if I wish to put my originals/RAW photos in the cloud? I don’t actually want to do that, mainly due to slow internet. I can use Classic, upload smart previews, and make edits on mobile on the 20 GB plan, regardless of my library size? That would be great as I’m running v.5.7 and it’s been really buggy under High Sierra. Yep, you’ve got it Matt. Like a lot of people here, I’ve been on the photography plan, and use the mobile app. I copy my files from my Fuji to my phone or tablet, let it upload the photos, and later they are waiting for me on my desktop LT. I just switched over to the Lightroom CC plan, but would like to keep my main desktop as a local backup of photos, and have my tiny MacBook use LR CC. Is it possible to use both classic and CC? Can I even use Classic if I signed up for CC? And if I can, when I upload files to CC, will Classic download them and store them locally automatically, as it has been doing up to now? If you’ve switched to the Lightroom CC + 1TB plan, it doesn’t Lightroom Classic. But yes, you can keep a local copy of your photos on your main desktop. Just go to Preferences > Local Storage and check the “store a copy of all originals locally” checkbox. You can also set the location of the originals in that preferences dialog, so you might want to select another hard drive. Was trying to update LR6 so I could use a dehazing preset. Not trusting Adobe I usually watch like a hawk for problems. Got called away and to my dismay found I had been given a 7 day trial of 7cc and the cloud. For one project I have 650 GB photos and 3 external Western Digital backups. $100 for 2 T external hard drive. Being old school don’t want to use the cloud. One day four before it reverts as I won’t buy it. It did speed up an already blazing fast laptop that Win 10 has messed up with the Creator upgrade? HOW WAS THIS UPGRADE CALLED CREATOR, SHOULD BE DESTROYER!! Some programs are so buggy they hardly work, LR now crawls and freezes. Going to the cloud does not fix the MS nightmare on earth! Know most pros use Apple. Hope to the OS works better with this upgrade. Experience so far….blah. Since I have had to recreate my catalog many times it will just be another day of using the last back up or at worse reinstalling LR6. Sick of Micrsoft and Adobe trying to improve my digital life…..
Ugh, yes! Ok, you haven’t upgraded your catalog, right? or did you? You’ll want to uninstall Classic, reinstall Lightroom 6.0 and the 6.12 patch from https://helpx.adobe.com/uk/lightroom/kb/lightroom-downloads.html, and if you let it upgrade your catalog, make sure you open the LR6 one. Great workflow explanation. Using Classic primarily and only syncing certain collections (the ones I am working on at that moment) is certainly the best workflow for me. One clarification question…if I am on the road and import with CC (on a laptop for example) is there a way to then move those files off the cloud and into local storage once I get home? I know that currently I can take a photo on my phone with LR mobile and then use the desktop app to copy the original to a local folder. I am hoping it works the same. Yep, you can do that. So you’d importing into CC on your laptop, then when you get home, let CC download everything and move the files into your local storage, if you don’t have the preference set to put them there automatically. Then select the photos in All Synced Photos and remove them just from that collection. That’ll keep them in your Classic catalog, but remove the originals from the cloud. If you then want the smart previews back up there, you can put them back in All Synced Photos. Thanks so much for the quick reply. I am sure you are getting hammered with questions since yesterday. Discovered this page from hearing you on the improve photography podcast and have been a fan ever since. Hi Victoria — thank you so much for all the effort you’ve put into this page (post and comments), it’s really helpful. The above is the workflow I’m looking into: add the pictures on CC on the road (either to iPad or MBPro), and consolidate once back at desktop on Classic. I’m however not sure how this would work: should I launch CC on my home desktop, download the originals (automatically or not), then manually import them to Classic? You mention the All Synced, but those would only be smart previews, so removing them just avoids duplication in the catalog (and gaining space back on CC)? Apologies if I’m repeating what you wrote, I’m not fully certain to have that workflow in my head yet. And thank you! I tested this myself as it’s my ‘travel’ workflow!!! Hi Paul (what a nice first name you’ve got!) — I’ve tested your workflow with a few dummy pictures and it works just great. I’m flying for a week tomorrow and I’ll be doing using just that. Thank you so much for taking the time to answer me here! Excellent, Paul, enjoy the week! Kudos for the effort you put in this comparison. The info is very thorough and not equaled on Adobe’s site. Thank you Steve, it’s been quite a job! I will definitely stick with LR6 on my computer. I don’t want any cloud. How do I find out if I have a “perpetual license” for my LR6? I have a DVD for LR4, and then I upgraded to LR5, and then LR6 via the official website. That’s absolutely fine Renata. If you don’t pay monthly, you almost certainly have a perpetual license. I can see what Adobe is trying to do with LRCC, and it will be a great product in the future, maybe?? but until internet speeds are super fast and internet plans are cheap it’s dead in the water. Also, their own plans are out of reach 5Tb = $87pm!!!!! Yeah, I’m sure prices will come down in time. It’s very early days for this cloud stuff. Since the 1TB limit should allow me to sync all my smart previews to the cloud (and continue using Classic similar to the way robertisrael does), is there a good guide on how to automatically generate smart previews and have them sync automatically to the cloud with this new Classic CC version of Lightroom? Even better news Holly – smart previews don’t count towards your quota! So even 20GB would be enough if you’re not syncing originals. There’s details on how to sync from Classic in my LRCC/6 book (Sync chapter) but I’ll get blog posts done on a few of these workflows over the next few weeks. So I am brand new to lightroom. I have been shopping around for a photo organization and back up program to start tackling the issue of organizing my 100,000 personal photos. Then I realized I am already subscribed to the $10 adobe photographer package for photoshop and I already have lightroom. I am more than willing to upgrade to the terabyte storage option, but I am still really confused and don’t know what to do. My first issue is that my photos are currently stored on two different computers, but there are duplicates between the two. So my thought was to use the cloud to combine them all. But then I also want all of my photos stored locally on my desktop, which currently most of them are (along with the ones stored on my laptop), but there is no organization of them. So if I upload them all to the cloud, and then select to store them locally, is it going to create a duplicate of all my photos? Or will it reorganize my current file structure to match the organization I am using in lightroom cc? I also want to delete a lot of photos while I am organizing, but it seems like I would want to do that before I upload to the cloud, so I am thinking I would need to use lightroom classic for that? What I really want is to use classic on my desktop to organize them and organize the local file structure, and then upload them all to the cloud using cc. Is there a way to do this? Can I use the two in tandem? When I followed the flow chart, that is the option it led me to. But how to I do it? Hi Whitney. I think your first question to consider is whether the new Lightroom CC has ask the features you need. If it does, I’d skip worrying about the folder structures, get everything into Lightroom CC and organize them in there with albums, deleting stuff asking the way. you could always pause sync to delete stuff before it uploads. But in answer to your question, yes, you can get them all into Classic, organize them, then either migrate to CC if it has all the features you need, or get the originals to the originals to the cloud. It’s a bit of a minefield, trying to continue to use both together, so I’m working on some detailed blog posts. Watch this space! You can get started in Classic in the meantime. Now you get originals in the cloud you can access anywhere, not just smart previews, while also retaining the powerful editing capabilities of Lightroom Classic to work on all your images. I’m assuming that new edits made in Classic for those photos in the LR CC cloud will sync nicely back up. There are definite perks with having all originals in the cloud, for when you wish to export or print on your non-desktop device or simply away from home. I’d hate to give all of those new features up but LR Classic is still too powerful to give up completely too. There would certainly be things to watch out for as far as prepping your catalog file correctly with the collection sets and collections, managing your keywords..etc. Would also be wise to make sure you tick the option to store a copy of originals on your hard drive still, or simply just never delete those originals off your local drive. Thoughts on this particular migration case? am I missing something big or could this potentially be a viable and relatively pain-free “foot-in-both-camps” use case? Trying to get originals to the cloud and continue to use Classic is a bit of a minefield Jay, and I’m still trying to work out all of the ramifications as it’s not really designed to work that way. You might be missing some metadata in your Classic catalog if you do that, as well as losing any books, publish services, etc. There are two main options that I’m exploring. One is migration, and then enabling sync in the Classic catalog again (it’s turned off by default during migration). It kind of works, as long as you remember to add all new photos to LR via the CC app rather than Classic, and being aware the keywords added/changed later won’t sync. There may be other pitfalls I haven’t come across yet. The other option is writing all the metadata to the files before first sync (to get existing keywords to the cloud – may require emptying your existing cloud stuff), then syncing everything to the cloud as smart previews, and then once it’s finished syncing, adding the same originals to Classic. In theory, it’s smart enough to recognize these are the originals of photos already stored in the cloud, and just upload the originals to the cloud and link them up with the existing images. Both options are fraught with potential problems, so back up your Classic catalog and photos before attempting anything along these lines. If you try it, let me know how you get on. I have already been using LRM to get originals in the cloud and still use classic on my desktop – I import my photos to my iPad and let them upload from there and then down,lad to my desktop. Of course, this only works if you have a mobile device with a lot of space and a fast internet connection. I also don’t do much keywording. Hello Victoria, Thank you for posting information helping on sizing the best of LR. I still wonder how I can use LR in an easy and optimized way considering time for the task, digital resources and money. Can you help me to understand how can I configure a workflow to upload photos from different deceives like my smartphone, iPad and DSLR cameras and deciding what to sync from mobile and from my desktop? It seems that I should use LR CC to sync mobile photos and LR Classic to sync from other sources, then consolidate all photos in my external drive with LR Classic. Hello. My interest is in using LRCC with the 1TB option as yet another backup option for my photos (largely personal). I would like to continue using Classic in combination with the new LRCC, but I do NOT want it to download everything to the cloud locally. I haven’t been able to find anything definitive on how to deal with this. What am I missing? Many thanks. Adobe didn’t intend anyone to use both at once, so they haven’t made it easy. I’m working on documenting potential ways of using both together, but it’ll be messy. Many thanks for going to all the trouble of explaining what Adobe is up to. If I don’t want to play their game, can I just stick with Lr 6 and forget about their “offer”? OR have Adobe decided to enforce the changes when Lr calls home to check if it is a genuine version. If the the alternative is the case, then, I am going to have to make the hard decision to dump Lr completely and go use ON1’s RAW. In some respects Adobe seems to be acting in their own interest forgetting about their global customer base, these actions usually happen when a company feels it is in a position of power to do what it likes. I have been using RAW as a Lr plug-in and I must say I find it a lot easier for what I need rather than using PS for heavy editing and Lr for my workflow. Thanks, Victoria, for this great info. I have been reading a lot about Lightroom CC and this is probably the clearest explanation I have found. I signed up for the 1 TB Lightroom CC plan and have found a decent workflow to use both Lightroom CC and LR6, which I still have as a perpetual license. You touch on a similar workflow above but I wanted to point out a few specifics. This might appeal to anyone who owns LR6 and wants the benefits of having 1 TB of cloud storage while also the ability to use LR6 as their main editing station with everything synced between mobile / Lightroom CC and the LR6. Note: I have not migrated my LR6 catalog into Lightroom CC (which doesn’t really use catalogs anyway). I upload my RAW / originals to the cloud using Lightroom CC. On LR6 I turn on Sync which brings them all back down to the desktop — all the photos appear in the All Synced Photos tab at their original resolution. Important to note that LR6 automatically makes a local copy of these photos; you can change the location of this folder in preferences but you cannot turn off the option. I have limited space on my MacBook hard drive so I moved this local copy folder to an external drive. LR6 is smart enough to wait until the drive is plugged in to initiate the sync, and once the drive is plugged in the photos are synced quickly. I have created a Folder in my catalog for this “local copies” folder, and I leave the photos in there, which allows the photos to continue to sync (all edits and metadata as far as I can see) between LR6 and all mobile / Lightroom CC apps. Once you remove the originals from this folder, they no longer sync back to the cloud apps. This works for me as I use Metadata to sort photos, but would be a problem for someone who wants to move photos into other folders and continue to have them synced. (Though you could simply create sub-folders within your “local copy” folder and those would continue to sync). The way LR6 handles Collections in this work flow is interesting. If you sync a collection of photos that you uploaded through LR6, only the smart previews will load up to the cloud app. This is how the LR6 and CC Classic have always operated. However, if you create a Collection with photos that were uploaded through mobile / Lightroom CC and then brought back down from the cloud into LR6, those collections sync back to the cloud at full resolution. You can still turn the sync of individual Collections on and off through the icon in LR6, but the photos in those Collections are full resolution. This provides a slightly cumbersome but effective workaround to a problem that many people have expressed with Lightroom CC, which is that you can not opt OUT of having photos synced to the cloud once they are brought in through Lightroom CC. With my workflow, you upload all of the photos through Lightroom CC, download them to Classic, sync the Collections you want (which are now full resolution, not smart previews) and then go back into Lightroom CC and remove the photos you don’t want in the cloud. (Similar to how you would manage an Apple iCloud Library). Note that even when LR6 Collections are synced to the cloud (and show the cloud icon), LR6 still needs to access the local copies to make edits. Those same Collections can be edited in Lightroom CC straight from the cloud. The edits sync back and forth perfectly. Also, new Collections created in LR6 will show up and sync in Lightroom CC, but Collections created in Lightroom CC do not show up in LR6, so you need to initiate the collection process through LR6. (Which you would be doing if you are truly using LR6 as your work station. If not, just skip all this and switch to Lightroom CC and be done with it). So, if you pay $9.99 and own a perpetual license of LR6, you can enjoy LR6 and all that cloud storage (vs paying for the Photography plan and only getting 20 gigs, or paying $20 a month for Photography plan with 1 TB). 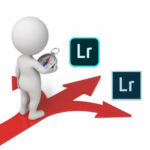 But, how come you sync photos with LR6? Weren’t mobile features limited to the CC versions, classic or not? I thought we are not getting any “cloud” storage unless we’re on a monthly plan, are we? Sorry if I’m missing something. Hi Victoria, thanks so much for this article, it’s been amazingly helpful. I am also concerned with storage as I could easily eat through the 1TB in a single wedding season (and more) but I love the idea of culling on my iPad and editing in Classic on my Mac. I have an idea though. I’m actually in the middle of trying this out on a smaller group of photos (just under 100). 1. Import to LR CC on the Laptop (MBP). Either directly to the mac or realistically for me, am ext HDD. This will then keep originals on the drive (80% capacity set maybe) and upload the originals to the cloud. 3. Publish to Shootproof, design albums, usual stuff but in Classic as I can rename files etc. 4. This is my question really? Once client has photos and album etc. I always convert to Lossy DNG in “Classic” as they are fine for quality and archiving and I have full 100% quality jpegs now on shoot proof if I need them. This would save 60-70 percent on file sizes but would the lossy DNG sync to the cloud too? Thus meaning we can have 3-4 times more images for our 1TB or more depending on plan? If so this is perfect. Import pics at the wedding, I’d still back them up to a back up drive when home but then just let them sync, edit, deliver, then shrink that wedding after culling from 20gb to 5gb using Convert to DNG with Lossy. Now that could be the game changer we need? if it works like that. Ok, It works. Converting to ‘Lossy DNG” (Which is fine) on the iMac in Classic, rewrites the original file on the MBP therefor meaning less space in the cloud. Also renaming the files in Classic as normal also means you’ll have the file names updated to. Sorry if this is obvious but it means It’s 100% usable for me now. Love it! Thanks for testing the theory and sharing the results Derek! That’s a good workaround for some people! Good plan Albert. Hopefully the prices will come down over time, as they start to gauge how much people actually need. Currently I am using LR CC 2015 and have over 1TB of photos and want to be sure that my photos are backed up at home and not exclusively on the cloud (I could do cloud and at home, but don’t want to be cloud only). I don’t necessarily need all of the features of Lightroom. I’ve also very meticulously put photos into folders, which I’d like to preserve somehow. That said, I would like to find a way to access/edit/file my original photos when I’m on the road. What’s your recommended solution? So far, I’ve only ever accessed/edited/filed my photos from the same desktop computer at home, so any improvement and ability to do this remotely will be great! Would Lightroom CC (the new one) have all the features you need? If so, migrating to that app would allow you to have your photos in the cloud and also store a local copy, which you could back up to your heart’s content. If you do need the features of LRCC2015/LR Classic, there aren’t any perfect solutions. Adobe are really trying to separate LR-as-we-know-it from the cloud, so there are some workarounds that I’ll be documenting in my upcoming Lightroom Classic book, but aren’t sanctioned by Adobe, so probably won’t get published on the blog. Thanks! I don’t necessarily have intensive editing needs, but what I really want to do is keep my files in folders. Is there any option that allows me to edit/file/manipulate photos remotely, but also keep my photos in their folder? Do they specifically have to be physical folders, or would virtual albums (aka collections) work? If albums would be ok, the trick is to drag the folders down to the collections panel (to automatically create a collection of each folder) and recreate your folder hierarchy as collections. Then when you migrate to Lightroom CC, that same collection hierarchy becomes CC albums. And in LRCC on your desktop, in preferences, check the ‘store a copy of all photos locally’ checkbox so it keeps a copy of every original on your desktop (albeit in dated folders on disk). That’s an interesting thought, which I had never considered. What are the pros/cons to that option? Pros are everything’s in the cloud and available on any device. Cons are LRCC’s still more limited in features right now. Beyond that, only other major con is there’s no kind of “trash” functionality in LRCC right now, so you have to be careful deleting files. Personally I’d want to back up that local copy with backup software that retains deleted files, at least until they add some kind of 30 day undo for deletion or suchlike. Thanks, this is very helpful. And Classic retains a folder structure, whereas CC is more based on keywords without folders, correct? Yes, CC’s more albums and intelligent AI search than keywords (although keywords are available). Any details on plans to include the PhotoMerge functionality in the New Lightroom CC? They don’t generally announce their plans in advance, but I think it’s likely. For a weeks, I’ve been wondering around without my desktop and iPad/iPhone syncing up in Lightroom. Your flow chart is exactly what I needed to see to help me figure it out. Thank you! I’m really pleased it helped Carole! How do I go about syncing just the smartpreviews ? I just started messing around with Lightroom Classic as my primary for photo organization and editing and syncing collections to CC and editing them online and posting the albums in a gallery. Anything synced up from Classic is a smart preview – it’s unable to upload originals. Then what is eating up my space ? Something is using around half of my 20 gigs of free storage. Is it pictures from mobile maybe ? If I am using lightroom app as the camera, does that use space ? If I am using the built in phone camera, then lightroom app mobile, pulls in the photo, does it then use space ? Pictures added/captured on a mobile device would count for sure. Thank you for a very well written and clear article, and a massive thank you for then answering everybody’s questions!! So my position is I am just getting back into photography after the shock of being able to take good/convenient photos with a smart phone! My girlfriend and I are setting off in a motorhome for 1 year traveling around Europe and I plan to take a lot of pictures and want to start editing them. I have never used LR or PS before and all my old pictures are Jpegs so I do not want to import anything into LR, so its a completely fresh start. My ability to connect to the internet will naturally be quite sporadic and generally quite slow. I have a MacBook which is what I intend to install LR on but would also like to be able to use my mobile in my workflow to sort and cull bad photos with the main editing then done on the MacBook. I already have Dropbox and I am aware that I can use this with LR Classic to give cloud back up and I can also use the Dropbox selective sync option to only have what I need on my hard drive. Is there any way to sync the editing/culling I do on my mobile with my laptop without an internet connection? What LR/PS option/workflow would you recommend I go for? I am presuming the photography plan with LR classic but I am really interested to hear you opinion on the workflow for someone with limited internet connection, as I would really like to be able to sort through my pictures on my mobile as well without the possibility of replicating photos and doubling up on work. I am going on a LR beginners course run by the London School of Photography on the 26th of Jan so need to decide before then and get it installed and set up! Thanks in advance for your help Victoria! 1. There isn’t any offline sync between laptop and mobile, but Classic syncs much smaller smart previews up to the cloud and down to mobile, which is more viable than full resolution on slow/limited internet. 2. Your beginners course will almost certainly be on Classic, or perhaps an earlier version (which would also apply to Classic). There are a lot of comments, so I apologize id this is redundant, but this is the best source of info I have seen on CC / Classic interaction on the web! +The ability to rename large batches of photos based on [metadata] their caption. +Using XMP files to share adjustments (I am assuming this is not possible on CC). My main goal now is to collaborate with someone to split tasks. It seems to do this we need to use the same account, that is fine. For now I have my Classic and CC synced and the relevant collections are synced up as well. My colleague can access via her CC (logged in with same account) and make changes (flags and other metadata) which in turn sync back to my Classic. Great so far! What would be great would be if her copy of Classic (of course logged in with same account) could also sync to CC. We have tried naming the catalog exactly the same but does not seem to want to sync. I guess this is not possible? I am wondering what the best workflow that could allow either of us export the files with their names and or apply adjustments using XMP sidecar files rather than the CC interface. Does anyone have any thoughts on this? Oh, on more thing I am not clear on is if photos are added via the Classic Desktop app and synced up to CC, are the originals synced to the cloud? Woops, got my answer to this already, no they do not upload originals! In which case, in order to make the HOMEBASE Classic, but still have Originals online I would need to use a workaround as you discuss, E.g. using CC to upload then sync back. Bummer, that is a messy solution. I guess they will be developing this rapidly, hopefully a slicker solution soon! You’re right, you can only sync one Classic catalog, so you’ll have to decide who is going to look after that catalog. And as you’ve noted, Classic doesn’t sync originals to the cloud. If you need originals up there, you have 2 choices – either import into CC and wait for them to download into Classic, or import into Classic, sync smart previews to the cloud, let CC finish syncing those smart previews down, then add the originals to CC. It should be smart enough to recognize they’re originals of photos that are already in the cloud, although it’s undocumented. I’m working on more detail for CC/Classic workflows in my LRClassic book due out later this month. And exporting XMP from CC can only be done by Save As original format – it outputs a copy of the original file plus XMP. BTW – I keep seeing it mentioned that LR Classic CC doesn’t upload originals . . . only smart previews. I just want us to remember however that LR Mobile DOES upload originals and syncs back to the desktop. So, when I’m on the road, I load my originals onto my iPad and into LR Mobile. These original images then sync to desktop and are there waiting for me to finish editing. I just it relevant to remind us that you can sync originals TO LR Classic CC just not FROM (without some workaround). Oh, my goodness! Thank you for this. I was trying to understand why all the videos describing batch edits didn’t match up to the interface I was using and it was driving me insane. I’m installing CC Classic as I type this because I have 192 pictures from Christmas still to edit and there are some really basic edits I want to sync across the whole series and there is no way I want to do them by hand or having to paste them image by image. It looks like Adobe are pushing CC as the way to go but until it has some basic features like batch editing it’s not good enough for me. This feature comparison has also shown how much I’ve been missing by using the ‘wrong’ version too. Glad to help Andrew. Sync/batch editing is the one major missing feature of CC at the moment, IMHO. Once it gets that, it becomes a serious contender for a lot of people. I have some questions about the limitations of using LR classic CC together with LR CC. I understood, that after importing the pictures in classic I can sync collections to CC. Is anything synced? I read that key words are not synced, because there are handled in different way in CC and classic. What’s about all other metadata? Are any modifications synced n both directions? Does somebody found an overview about the limitations of using LR classic CC together with LR CC. Something similar to the table on the page would be nice. Victoria – Super flow chart, pity Adobe don’t think to help customers in the same way. It would be good if you could use your contacts in Adobe to press them to understand we don’t all live in a constantly connected high speed internet region, nor all use hyper expensive iPads, nor have bottomless money pits. Also BTW, $9.99 that oh so often quoted how cheap it is, is actually $14.00 (converting GBP to USD) here in the UK – so why for the same service do we pay an additional $5/month ? The discriminatory pricing and constantly changing ground rules have ensured I’ll migrate away from CS6 by summer and LR once a good asset management package is available. Hi Steve, yeah, don’t worry, they’re well aware that we don’t all have superfast internet, or want to store all our photos in the cloud. CC is a new option for those who do, but Classic continues to be developed too. It’s currently £9.98 here in the UK. A large chunk of the difference is due to VAT. US prices are quoted excluding local sales taxes, whereas UK prices are including VAT. Some of it is also due to changing exchange rates. The UK prices have gone down as well as up over the course of the last few years, depending on how the GBP<>USD exchange rates go. I still haven’t upgraded my light room classic. The horror stories of the first users to switch scared me off. I also heard that they’re coming out with the 7.2 which is supposed to concentrate on performance improvements. Do you think I’ll be safe to upgrade to 7.2 when it comes out? Yeah, it’s looking pretty good at this stage. Even 7.1’s showing fairly minimal issues. 7.2 does have some nice fixes in it. It’s not perfect, but another good step in the right direction. You can always install 7.2, let it upgrade your catalog and test it for a few hours before you commit to doing serious work in it. You did the comparison work, that Adobe didn’t. Thank you for this. It’s clear now, that the cloud version is not for me (lack of features and limitation of disk space, since I already own 900GB of photos and I hope to shoot many more…). However, I can imagine, that people who travel a lot will love the cloud version. Hi Victoria. I am using Lightroom CC (cloud) across iPad Pro 10.5, Mac & Windows. I really like the flexibility it allows me. On my iPad I can view exif data in grid view by two finger tap on the screen. But on desktop I can’t see any way of viewing exif data in grid view. Is it possible? Not at the moment, only in the Info panel on desktop. If I import photos to Lightroom CC on desktop 1(or my iPad) but have elected to store a copy of all originals only on desktop 2, are originals of those imported photos also saved to desktop 1? Or does Lightroom purge originals from desktop 1 after upload to the cloud? BTW I’m using Lightroom CC on PC at work, Mac at home and iPad Pro travelling and it allows simultaneous sign in on 3 devices. Very handy. Hi John. The originals would download to desktop 2 when next online. Desktop 1 would purge them “at some point” after they’ve finished uploading. Exactly when depends on how much space you’ve allowed it to use in Preferences. If it’s still got designated space available on desktop 1, it’ll keep them cached locally until it needs that space for something else. Such a helpful thread, thank you! While the originals were deleted from the cloud (which is what I wanted), I do not believe they were deleted from the local disk where I am running Classic CC. I can understand why one would NOT want to have their local files deleted, but I certainly did want them to be and now I am not sure how to find the 5000+ images that are removed from the collection (Album) but orphaned within my FLAT (Eeeek) file structure! Obviously I will need to re-think the file structure to be prepared for this, but for now, does anyone have a suggestion on how to track down these local originals? Yeah, there’s a whole bunch of complexities because they’re not really designed to work together. I’ve documented all the known issues in the Sync chapter of my LR Classic book, and I’m updating it as I go along. The trick for deleting is to mark as reject flag in CC and then delete in Classic. Tracking down the photos in Classic could be tricky. If all of your photos were synced, you could try selecting all the photos in the All Synced Photos collection, then click on All Photographs and Edit menu > Invert Selection. That should live you just with unsynced photos (and videos). I will try that thank you! I certainly can see they were not meant to work together, and am coming up with a custom-workaround workflow of my own, since I really need them to talk to each other. The photos are no longer in Classic, since they were removed from CC, but the originals are still on my Hard Drive. Luckily the new catalog I am building is not huge yet, so what I think I will do is select and move all existing photos in my Classic to a new physical location, which will leave only the orphaned photos in the old directly. A brute force move, but I think only way possible. I tried deleting in Classic (from rejected photos in CC) but I think they tried to sync back…. Am I wrong about this? Deleting them from CC won’t have deleted them from the Classic catalog. It will have just removed them from sync and from any synced collections. Hi. Thank you for this very informative page. I am currently importing images to LR CC 1terabyte cloud but have a concern that I maybe losing some images since I rarely renamed my pictures; it has the same sequential numbering format and was separated by folders. I also have a lot of duplicate photos from iCloud…So during my import it originally detected ~63k, but now only importing ~47k…My question is did LR CC help me remove the TRUE duplicates (like same capture time with same device or something) or my fear of all those photos with the same file name? It’s not only looking for matching filenames, but the hash of the file itself, so the ones it’s removed should be true duplicates. Thanks for your great article! I have read it (along with other sources) to try to figure out in which direction I should go. Relative to yourself and others here I am surely a beginner, having only begun using a DLSR (Canon EOS 6D II) for five months or so. Perhaps you could say I am striving to eventually be an “advanced amateur.” I have never used any version of Lightroom or Photoshop and now want to enter this world. From the wealth of detail in your article I must admit I’ve slid into “analysis paralysis” and would love some clarity to just make this decision and move forward. I’ve seen that, although Lightroom CC presents improvements in stability and usability, it is still missing several features many consider necessary, and I worry that I will miss these as I venture up the learning curve. I just got my hands on a Rokinon/Samyang 14mm/2.8 that contains a built-in AE chip for my Canon. I have read and seen how this lens, although awesome in some aspects, has some distortion and vignetting issues that I hear can be corrected with lens profiles. This feature, as well as others — like HDR merge, image stacking for astrophotography, panorama stitching, etc. — makes me wonder whether the Classic version might fit better, as I see that the implementation of these might be limited or nonexistent in the CC version. I also hear that Lightroom is a good solution for keeping photos organized. I will have nowhere near the volume of images as a pro would, but I have definitely struggled in the past trying to establish an organizational ecosystem for photos that works well. Storing all my photos on the cloud (and paying monthly for it into perpetuity) seems alien to me, but I willfully acknowledge that I have a lot to learn and am open to new ideas out of my comfort zone. What could you recommend for those in my situation? Hi Michael, don’t worry, I know the feeling. Lens Profiles are in CC desktop as well as Classic, so no issue there. They’re only missing a UI in the mobile apps. HDR and pano merge, I’d expect to make the cut sooner than later, probably within 12 months, so that just depends on heavily you think you’d use them right now (or whether they’re just a nice idea at this stage). Astro image stacking isn’t in Classic either, so you’d need a third party app for that whichever way you went. If you have fast enough internet, I’d suggest… since you’re just getting started, and you have loads of learning to do on the photography side of things, I’d keep Lightroom simple for now and start with CC. Classic has lots of features, but that also means it has a huge learning curve and quite a lot of bugs, so you could end up overcomplicating things. You can always switch to Classic later if you find there are specific features you really miss, and you’re not locked into Adobe’s cloud forevermore (you can download at any time, and I’d suggest keeping a copy locally anyway). Thanks for the reply! I went ahead with Lightroom CC and am already feeling very comfortable with the program. It’s wicked easy, and actually feels a lot like the software I use for microscope imaging (I work for Zeiss). I have already figured out the distortion and vignetting correction for my Rokinon and it makes a huge improvement! After organizing my various photos I’ve saved over the years — and realizing there are over 16,000 of them — I am even more happy I went with the CC option since you get 1TB of cloud space for only $10/month. I have heard that fiber Internet service is coming soon to my neighborhood in Colorado. Now it can’t come soon enough! Glad to hear it Michael! This is correct, it’s subscription only now. The Photography Plan includes both Lightroom Classic and Photoshop, which might be a good fit for you if you’re not interested in cloud space. I have been using Lightroom Classic for over 10 years now and have about 38,000 images stored locally. I like the features included in Classic so I have the 1TB Photography plan. However, I also want all my files in the cloud so that I can edit them on my iPad or iPhone whenever I need to, and to have peace of mind that my files are stored off site (they are also stored on Backblaze). I’d also like to stop using external hard drives if possible. I have been syncing between Lightroom Classic and CC until I realized that only compressed dng. previews (?) were being stored in the cloud and not the original files. So I decided to migrate my whole catalog. But when I did so 5000 or so images seem to be missing from CC (they show up in the files archive online on my Adobe account page). 4 – stop using Classic and just use CC. I’m sure someone else has asked this question so apologies if it’s already been answered. Hi Sean. Don’t delete everything from the cloud, as catalog’s can only be migrated once without some significant hassle. You can turn on Sync in your Classic catalog, that’s fine. I’d try to figure out which 5000 photos are missing from CC. Are they showing up in your Classic catalog? I’ve turned Sync on using Classic and will start uploading new photos with CC so that they go to both and I will no longer need to use an external hard drive. The 5000 photos are in Classic but they showed up in CC after I turned Sync back on. Ah good, thanks for the update. Final thing to check in CC… open the Refine (Filter) bar and check the sync status is NOT set to synced from Lightroom Classic for any photos. If there are any, those are photos that only have smart previews in the cloud. Thanks. It seems that all of my photos from this year are set to sync from Lightroom Classic. How do I change it? I have an optional path other than that shown on your flow chart. I use LR 6 perpetual ( or could use CC without cloud storage) have an external HD with all photos, catalogs and libraries. The very portable Seagate Backup Plus is small enough to pack for travel or to just sit on my desk below my iMac. I can take it with me and use it with my Macbook also. Plug and play. Nothing is uploaded to the cloud, everything is backed up daily or hourly to alternating backup drives. Works extremely well for me. I always know where my photos are and that they are safe. Yeah, that’s a good option I describe in detail in my book. I am currently on Lightroom 6, and am considering updating to the CC versions – held off mainly due to wanting more time subscription-free, and seeing people having issues with the earlier releases, but I’ve not seen as many complaints online with the more recent versions. I’ve been using LR for a few years now, but have only been learning post-processing beyond the basic/global slider adjustments, e.g. selective adjustment brushes and graduated filters etc., for the past half year or so (Note: Your starter eBook was very helpful!). So I have much learning ahead. I’m debating whether to stick with LR Classic, due to familiarity with the interface, or to go down the LR CC route. Based on your flowchart and table, I do use features particular to Classic such as direct Flickr and SmugMug export, and exporting with custom profiles for print, using profiles provided by the photo lab. Also am attracted to the range masks on localized adjustments, LR6 doesn’t have them though. A big drawback of my current workflow is that my catalog and photos are all at home on my desktop computer, and I have no means of editing photos while travelling, which is when I do the majority of my photography. Also I am using LR only with my dedicated cameras at the moment, while actually capturing a fair number of images with my phone as well. Is shifting to Lightroom CC the best way to solve these workflow issues? If so, how would one get around the shortcomings in exporting? Alternatively, I’ve read about sticking with Lightroom Classic, and making a temporary catalog on a portable computer, to be imported into the main catalog later – how well does this work in practice? And would it play well with using LR Mobile to do edits on a tablet, or importing photos taken using my phone? Would syncing between Classic and Mobile play up if multiple LR Classic catalogs are involved? Also, is syncing between Classic and CC still problematic in the latest releases? Thank you for your time in reading this, and apologies if I’m repeating questions answered elsewhere! > Is shifting to Lightroom CC the best way to solve these workflow issues? Yes, CC is by far the simplest way of making photos available on other devices, but it’s not the only option. > If so, how would one get around the shortcomings in exporting? I’d run a Photoshop action, but that limitation could be an issue for you for now. You might want to go with Classic for now and switch when that feature is added. There’s a few different options. Sticking the catalog on a portable drive that you plug in to whichever computer you’re using works pretty well, and is the simplest of the Classic options. If you want to sync, I’d stick to one catalog. Having a Classic catalog on the desktop, and then CC on the travel computer can work nicely. There’s some pitfalls to avoid because Classic isn’t a true sync client (more of a distant cousin!) but they’re all detailed in the Cloud Sync chapter of my Classic book. I use LR Classic almost exclusively, but I like a few options on LR CC. One is the search engine which seems to be superior, particularly with a sizeable catalog. (44K photos). I’d like to use both applications but I am confused as to how to keep the two LR versions in sync. If I add a new folder in Classic, it does not appear in CC (for example). How do I get the catalogs for the 2 apps to stay in sync? Thanks. No really easy solutions to that Paul, as they’re kind of distant cousins. Classic isn’t a “real” sync client, unlike all of the CC apps. One thing you can do is create a sync collection in Classic called something like “auto import” and in the Import dialog, set all new photos to be added to that collection, so they’ll automatically get synced. That won’t sync the folder organization though. Thank you, Victoria, for patiently answering my questions! OK, don’t laugh at me, but I STILL have all my photos (3TB) in Aperture. I just purchased Adobe CC and considering Aperture is really giving me trouble AND I just filled up my 3TB external, I need to move my photos. Currently I am dead in the water as I cannot import anything so I need to move fast! Question is do I buy a larger external, and import into Lightroom Classic, or import into Lightroom cloud, removing the need fora larger external HD? I am currently paying for a cloud-based back up plan, so I could go either way. Now…on to learn Lightroom! Hi Allison, I wouldn’t dream of laughing! I would buy a bigger hard drive whichever way you go, because even if you store the photos in the cloud, I’d still strongly recommend a local backup. For sanity’s sake, you need more than one copy of the photos! So with that out of the equation, I’d then think about which offers the best solution for you. For example, do you want to be able to access the photos from multiple devices easily, or do you need more advanced features that aren’t currently available in CC? CC is much simpler to learn, but requires a good internet connection. Make the decision based on those kind of factors rather than whether to buy a hard drive or not. Hi, Victoria. Thank you! I think your flow chart for selection is good, yet I don’t know what I don’t know, so thought asking an expert would be best. The forums haven’t really answered my question, but your input seemed quite expert, so I tried to find the best place to reach you with this question. I am an amateur ramping up my hobby slightly. I also have lots of of family photos. I want a cloud based service for back-up security and I like the idea of sharing with family and friends and accessing across platforms. I purchased the Photography plan and quickly upgraded to the 1 TB level as, like most people I think, I take advantage of digital and shot way more than I plan to keep, hoping for that perfect shot. I thought I would be able to choose what to upload or to delete what I did not want, but that has proven to be difficult – not even sure how to do it. So, if I want cloud storage, but want to determine what gets saved, what is the best option? It appears from the flowchart that I should use classic and somehow choose what to upload to CC (I suppose I will learn this when I begin to use the tool). Is that the best way? If so, is there a way to migrate the 3000+ photos already in the cloud to Classic so I can “start over”? Hi Laura. I’m out of the office so I haven’t checked in on the forums. There isn’t currently a way of doing selective sync to the cloud in CC, but if we’re only talking 3000 photos, I wouldn’t let that stop you. I currently have around 105,000 photos in the cloud, and I’ve found it’s made me more selective about which photos are worth keeping. I’d just pause sync when initially importing, delete the duds and then resume sync. You could migrate to Classic by simply enabling sync in Classic, so it downloads from the cloud. I wouldn’t rush into that though, if CC suits you well in every other way. Yay, didn’t know I could pause the synch. Will investigate how to do that – thanks!! Keep checking back hoping the big issues keeping me from CC will be added including: Rename photos on import and rename photos after, apply preset on import, compare view, view/add all exif data, hierarchical keywords, add full gps location, local adjustment presets, edit multiple photos at once, history of editing, export to any format/color space/file name. Last checked about 6 months ago and looks like none of those items have been resolved yet. Understand things take time, just wish their were a road map so we would know when missing items would be re-added and or if any of the items will never be added for some reason. The best you can do Chris, is vote on the feature requests on the feedback forum. That helps the engineering team determine their priorities, and you’ll get an email update when it gets implemented too.